Xypex is a unique chemical treatment for the waterproofing, protection and repair of concrete. XYPEX MODIFIED can be applied as a second coat to reinforce Xypex Concentrate, or applied by itself to damp-proof the exterior of foundation walls. Applied as a second coat, Xypex Modified chemically reinforces Xypex Concentrate where two coats are required and produces a harder finish. Where damp-proofing is required, a single coat of Modified may be used as an alternative to a spray/tar emulsion. Xypex prevents the penetration of water and other liquids from any direction by causing a catalytic reaction that produces a non-soluble crystalline formation within the pores and capillary tracts of concrete and cement-based materials. Xypex Modified, concrete waterproofing, is available in 9.1 kg and 27.2 kg pails and 22.7 kg bags. For normal surface conditions, the coverage rate for each coat is 6 - 7.2 sq. ft. per lb. (1.25 - 1.5 lb. per sq. yd. or 0.65 - 0.8 kg/m2). Xypex-treated cylinders and untreated cylinders were exposed to hydrochloric acid, caustic soda, toluene, mineral oil, ethelyne glycol, pool chlorine and brake fluid and other chemicals. Results indicated that chemical exposure did not have any detrimental effects on the Xypex coating. Tests following chemical exposure measured an average 17% higher compressive strength in the Xypex-treated specimens over the untreated control samples. After exposure to 5.76 x 104 rads of gamma radiation, the Xypex treatment revealed no ill effects or damages. Concrete surfaces to be treated must be clean and free of laitance, dirt, film, paint, coating or other foreign matter. Surfaces must also have an open capillary system to provide “tooth and suction” for the Xypex treatment. If surface is too smooth (e.g. where steel forms are used) or covered with excess form oil or other foreign matter, the concrete should be lightly sandblasted, waterblasted, or etched with muriatic (HCL) acid. Apply Xypex with a semi-stiff nylon bristle brush, push broom (for large horizontal surfaces) or specialized spray equipment. The coating must be uniformly applied and should be just under 1/16 in. (1.25 mm). When a second coat (Xypex Concentrate or Xypex Modified) is required, it should be applied after the first coat has reached an initial set but while it is still “green” (less than 48 hours). Light pre-watering between coats may be required due to drying. The Xypex treatment must not be applied under rainy conditions or when ambient temperature is below 40ºF (4ºC). 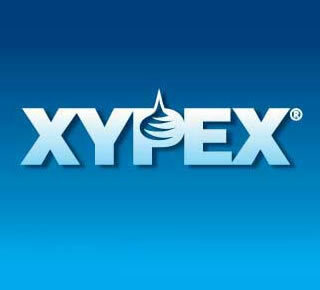 For recommended equipment, contact Xypex Chemical Corporation or your nearest Xypex distributor. Note: For concrete structures that hold liquids (e.g. reservoirs, swimming pools, tanks, etc. ), Xypex should be cured for three days and allowed to set for 12 days before filling the structure with liquid.